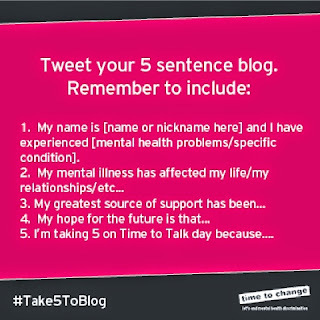 Loubee Lou Blogs: Let's Take Five #Take5toBlog. Today is a very important day. 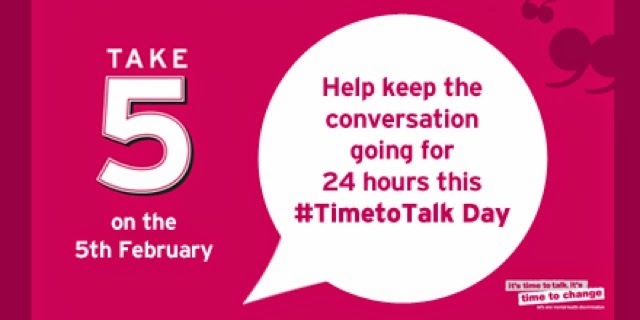 Today is a day when we spend 5 minutes talking about mental health. 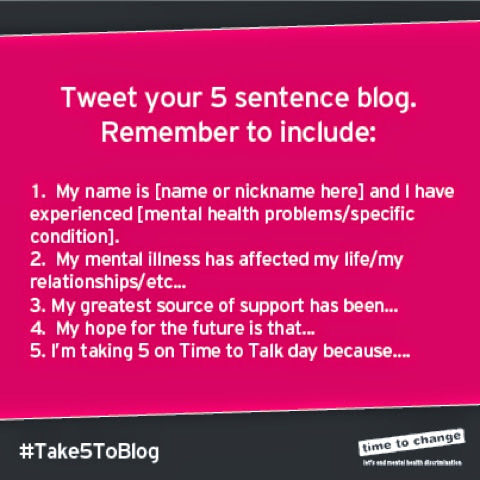 Just 5 minutes! 1. My name is Louisa Rowland and I have a lot of experience with mental health. Not only is it something I live with on a daily basis, it's a recurrent thing in my family. Bipolar, depression, anxiety, schizophrenia...you name it, it's probably there somewhere. 2. My mental illness makes things extra difficult. You all know how it has damaged relationships but it's also build some of the strongest ones I've ever had. I've lost and gained so much. 3. My greatest source of support has been my mum. She has supported me through every single day without fail. 4. My hope for the future is that I manage to find some peace in this madness. 5. I'm taking 5 on Time to Talk day because I believe if everyone did the same, we can quash the stigma that surrounds mental illness. Together we can do it! Mental illness effect 1 in 4 of us. Chances are, you know someone who has a mental illness even if it's been kept a secret.